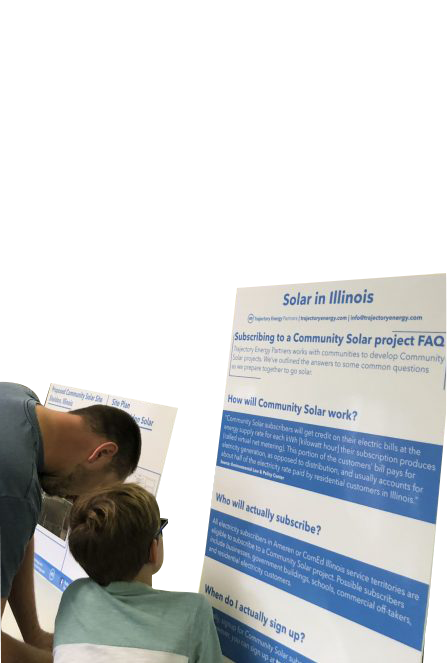 MORTON — Village Board trustees Monday got the lowdown on a proposed community solar energy project that would be built just outside Morton in an agricultural area. Representatives from Highland Park-based Trajectory Energy Partners spoke to trustees about Morton Solar, which would be constructed on a 16.11-acre tract north of Interstate 74 and west of Tennessee Avenue on land that would be leased from Glenda Kruse and Sherry Bliss. Trajectory is seeking a special-use permit for the project from Tazewell County through the county’s Zoning Board of Appeals. The request will be considered at the board’s Oct. 2 meeting. Because the proposed project is within 1.5 miles of Morton’s border, trustees can provide input into the request. They will do so at their Oct. 1 meeting. Morton Solar is projected to produce two megawatts of electricity for the Ameren grid that would serve 300 to 400 homes. By comparison, one wind turbine also produces two megawatts of electricity. Customers of Morton Solar electricity would see a 10 percent savings on their electric bill and the project would generate about $15,000 annually in real estate tax revenue, according Trajectory representatives. Rows of 10- to 12-foot-high photovoltaic cell panels mounted on posts driven into the ground would produce the electricity. The panels would be in a north-south configuration and rotate to track the sun through the day. A 7-foot-tall chain-link fence would enclose the panels and electrical equipment, and allow entry only through a locked gate. Pollinator-friendly landscaping would be planted. The panels would have anti-reflective coating to minimize glare “and you won’t hear a buzz outside the fence line,” said Josh Bushinsky, Trajectory co-founder and partner. No lighting would be installed. Bushinsky said the land for Morton Solar would be leased for 25 years, with options to extend the agreement for another five or 10 years. If the land is needed for another use like a commercial or residential development, Bushinsky said, the solar equipment would be removed. “We can restore the land,” he said. “No infrastructure is needed,” said Colleen Callahan, Trajectory’s rural Illinois referral partner. Morton Solar and similar proposed solar energy projects throughout the state are the result of the Future Energy Jobs Act passed by the state in 2016. Lottery drawings will determine which projects go forward. Also Monday, Morton trustees approved three business improvement grant requests. Each is for permanent landscaping. A preschool and day care center at 1800 S. Main St. also will add an enclosed entrance using its $8,329 grant. The other businesses with approved grants are a financial services office at 214 W. Jefferson St. ($4,945 grant) and a paper products company at 510 E. Courtland St. ($4,500 grant). Money for the grants comes from business district sales tax revenue.